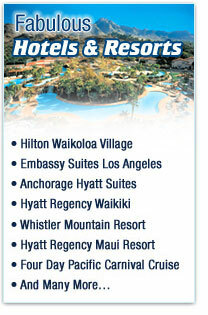 Jet to OAHU, "The Capital Isle"…Check in to the Hyatt Regency Waikiki, the island's most spectacular hotel. We'll hike to the top of Diamond Head to catch amazing Pacific Ocean views, then down to the beach where professional instructors will be teaching us surfing. 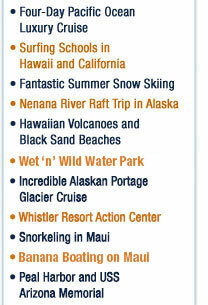 We'll tour Honolulu, visit the University of Hawaii, and cool off at Wet 'n' Wild Hawaii Water Park. We'll remember the past as we spend reflective time at Pearl Harbor and the USS Arizona Memorial. Enjoy great snacks and fun island smoothies at the International Marketplace. A final night of action and fun at exciting Laser Tag rounds out our visit. Jet to MAUI, "The Valley Isle"…We'll stay at the fabulous Hyatt Regency Maui, the premier Kaanapali Beach resort, with its half-acre swimming pool with 150-foot water slide and state-of-the-art health club. Activities include tennis, boogie-boards, and snorkeling right off the beach! Did somebody say "snorkeling"? Our Molokini Crater Snorkel Cruise is aboard a 65-foot catamaran with glass-bottom viewing, bbq lunch, water slide, and the best snorkeling you'll ever do! Above the surface, you'll ride the Pacific Waves on the incredible Banana Boat Adventure. Stroll through Lahaina Village for lunch and souvenirs and don’t forget to sit under the famous Banyan Tree. We’ll see Mt. Haleakala, the world’s largest dormant volcano, the centerpiece of Haleakala National Park and take a trip through Iao Gorge. Jet to HAWAII, "The Big Island"…We stay at the Hilton Waikoloa Village, Hawaii’s most luxurious hotel. Pools, waterslides, lagoons and waterfalls surround you. Need to get to your room? Take the monorail or go by boat! You’ll dig your toes into the world-famous Black Sand Beaches, and enjoy a fun dinner at Bubba Gump's. A great visit to Volcanoes National Park includes lunch at Volcano House overlooking Kilauea Crater. Watch for steaming lava pits and sulphur beds along Crater Rim Road. Look for Mauna Loa, the world’s largest volcano. We’ll have a Beach Luau on our last night, say our final good-byes, make our plans for future get-togethers,and get ready for our jet flight home!